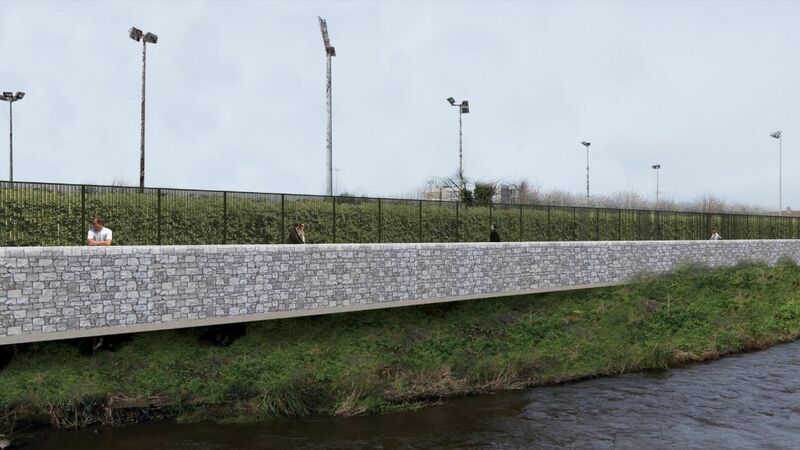 Dublin City Council are planning to build a short section of shared use path around 4 metres wide as part of flood prevention works along the River Dodder. The planned section will only be 450 metres long. But the new section and existing river-side path in Herbert Park will create a near 1km river-side walking and cycling route between Donnybrook and Ballsbridge. The planned section will be a shared pedestrian and cycling path around 4 metres wide. The path will run between the Donnybrook Stadium Grounds and the River Dodder. 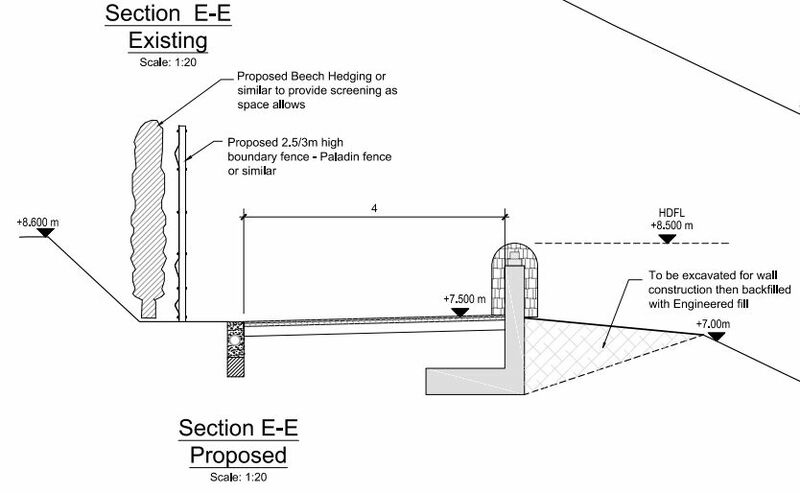 A small section — where the private boundary is close to the river — will include putting the path on a concrete cantilever with a stone-cladded wall. The Dodder Greenway will eventually be a continuous route linking Sir John Rogerson’s Quay through Grand Canal Dock, Ringsend, Lansdowne, Ballsbridge, Donnybrook, Clonskeagh, Milltown, Rathfarnham, Tallaght and into the Dublin Mountains. Submissions or observations can be made in writing, to the Executive Manager, Planning Department, Dublin City Council, Civic Offices, Wood Quay, Dublin 8, before 4.30pm on Tuesday, June 20, 2017 or by using the online forum at consultation.dublincity.ie — the detail files can also be viewed at the same link. a bicycle superhighway in my mind is just what it should not be…..there should be space for a casual stroll, dog walking, sitting on the rocks by the waterfall. I think the stretch between Donnybrook and Clonskea should be tidied up and left as is. Bicycles and people and dogs already share this route without the ‘superhighway’ element which would make such sharing impossible. This will be a fully connected route between the Docklands and Tallaght and beyond… can you give any examples of such an urban route where high volumes of people on bicycles and on foot share well, without having segregated paths? They mostly don’t need to share — there space along one side of the other of the river on 99% of the route to have separated paths for walking and cycling. The councils just need to be willing to build it right. I don’t own a car and have cycled all my life. But the Dodder Greenway will destroy key parts of the wonderful Dodder experience as it has been carefully created and evolving over decades. This magical river has been protected and cleaned and watched over for generations by user groups like the Dodder Anglers and by Dodder Action. The Dodder Linear Park which has emerged is primarily a WALK for WALKERS and is largely a WALKING EXPERIENCE. Cyclists of course also use it and that was never a problem. But the best part of the Dodder experience is the intimacy of a narrow track with trees and flowers and foliage and of course the river proximate. So WHY are we ruining it by turning it into a road width CYCLING HIGHWAY?? There are points along this riverside linear park where a four metre clearance cannot take place without taking down trees and generally ruining the existing natural aesthetic. Look at the picture above for Chrissakes?? Concrete and sterility. Why, why why are we taking one of the most beautiful nature walks any city can have (which cyclists already use) and turn it into a motorway for cycling which sterilises this??? 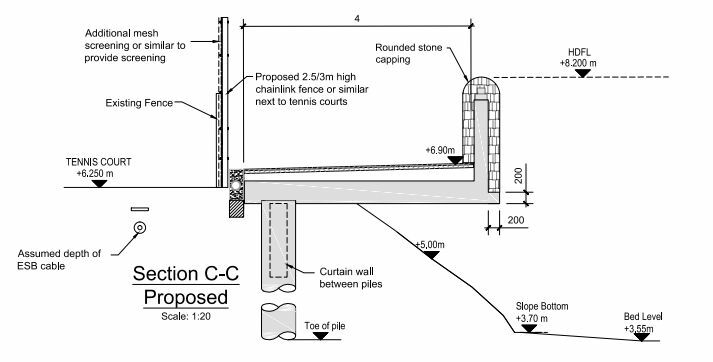 @Mark — First of all the “the picture above” with all the concrete is for FLOOD WORKS — the walls etc are NOT needed for a cycle route! The greenway route was never supposed to be going that way until it was fairly recently added onto the flood defences project for that short section. Overall, you have a good point… the position of this website and, at least apparently some people in Dodder Action, is that the cycling route should be kept on the oppsite side of the river from most or all of the unique walking paths. So, far example, the cycle route would use one of the traffic lanes on Beech Hill Rd / Beaver Row or at Orwell Walk the cycle route would use the exiting street (sharing with low-volume access traffic isn’t an issue). However, opposition to getting cycling done right along the route (including talk of “cycling highways” as if there isn’t a roadway along half of the route) will lead to one thing — the council mixing cycling and walking on widened paths which will destroy the unique paths that are currently there. Do we need to cut away trees and knock hedges to facilitate a cycleway plan up Killiney Hill? 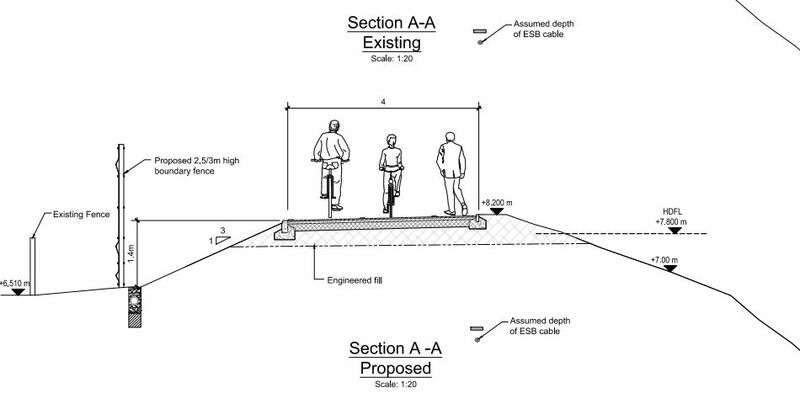 Should we blast bits out of the cliffwalks of Bray or Howth to accommodate wide cycle lanes? Some amenities are primarily walks largely for walkers.Leave them be. Like I said I am a cyclist (no car) AND a walker.